By the end of the growing season, plants have shuffled most of their remaining resources into their roots to store for the winter months. This is the time of year to harvest root-herbs and my all-time favorite is burdock root. The plant’s leaves are similar to the common dock, but the “bur” in the name alludes to the furry-looking barbed fruits, which spring from thistle-like flowers, that can reach a height of five feet. These clever seeds travel by embracing anything that brushes by them – animal fur, clothing, or bird feathers. The bur in the name might also refer to the sound critters make as they struggle to pull the seeds off them! Burdock grows freely in Europe, Asia and wetter parts of the United States and lucky for those of us in drier areas, it is a popular commercial crop. The root is available year round as a dry herb and only needs to be simmered 20 minutes to make a tea. Burdock (both the root and seeds) is an incredibly useful tonic herb that cleanses the blood via the kidneys and liver. Burdock root is a mineral-rich, downward moving herb that activates the kidneys, reduces fluid retention, helps break up calcium stones, and being rich in silica and iron, helps to strengthen connective tissue. It is an excellent herb for moving stagnant pelvic energy that is the result of standing or sitting in one spot for long periods of time without being able to walk briskly or stretch out the legs. Thus it is useful for treating sciatica, lower backache, stiff or painful hips or muscle pains radiating down the legs. Burdock can be added to formulas to help dissolve kidney and bladder stones, remove excess fluid in the abdominal cavity and help correct uterine prolapse. Both it’s mineral content and mucilaginous quality benefits the protective sheaths surrounding nerves, especially those in the legs and hips. Burdock also works through the liver and is one of the best blood purifiers especially helpful for arthritis, skin rashes, boils, eczema, poisonous bites (snakes, spiders, ticks) and acne. Look under recipes on this website for the Smooth Skin Tea combination. This root is rich in the sugar inulin, which can aid the pancreas in producing enzymes and insulin. If you imagine a pyramid within your body between the liver, the pancreas and the kidneys, you can get an idea for the territory that burdock covers. It works with the 3rd chakra or energy center of the solar plexus and lends integrity to your core, helping you “stand up for yourself”. It is a treat to have burdock root available as a fresh vegetable from fall to early spring. Eaten extensively in Japan “Gobo” root is added to miso and mushroom soups, stir-fry and stews. An easy way to cook the fresh root is to scrub it well with a potato brush, then cut thin slices and add them to any grain or soup you are preparing. This root can also be easily juiced, just adding a generous piece to carrot-celery-beet juice. 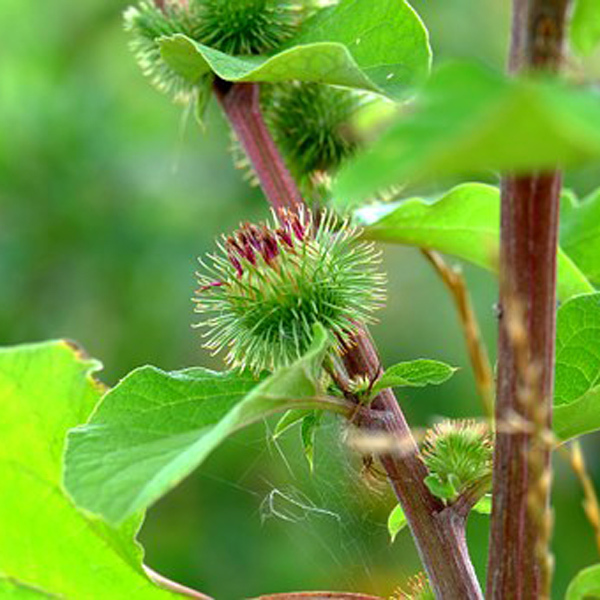 Burdock is healthy for dogs and cats too. Pets usually don’t want to eat the root, but if you cook your pet food, just add it into the mix and it’s nutrients will be released, then you can pull the root pieces out (and eat them yourself!). To store the benefits of this powerful herb for the year to come, you can make a fresh root tincture by placing cleaned and chopped roots into a blender and adding 70% vegetable glycerin to 30% vodka or brandy until all roots are covered (alternatively, you can make at tincture with 100% vegetable glycerin or 100% alcohol). Blend lightly, then pour into a glass jar, making sure all roots are covered with liquid, and store in a dark cabinet for up to two months. Check it occasionally and give it a shake. To decant your tincture, just pour it into a colander lined with cheesecloth and sit it over a bowl to drain. After all liquid has drained, gather the cheesecloth to squeeze out any remaining juice. Then bottle the extract in dark glass containers and store in a cool place.